The news is out on the Ranger Slayer, and we find out how and why she was chosen for Shattered Grid straight from the source. Spoilers incoming for Shattered Grid, so if you don't want to know you've been warned. 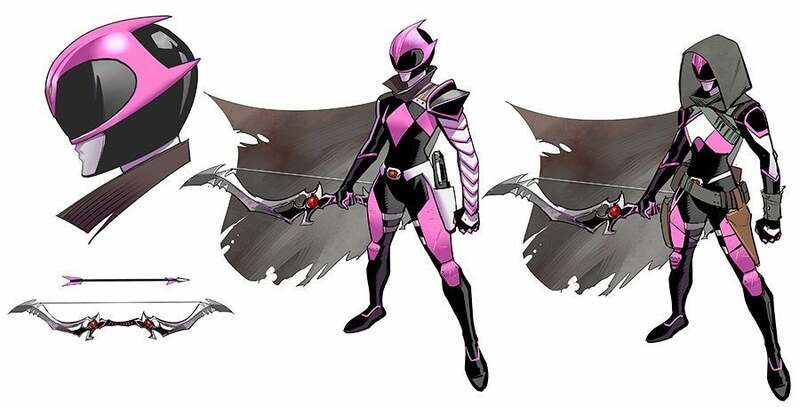 ComicBook.com recently had the chance to talk to Go Go Power Rangers writer Ryan Parrott and Mighty Morphin writer Kyle Higgins about the big reveal in last week's Shattered Grid prelude, including if that is really Kimberly in the costume. "Yeah, that is Kimberly from the Drakkon universe," Parrott said. "When we first decided that Go Go was going to be a part of Shattered Grid, Kyle brought up that sort of a wild card of Kimberly that hadn't been sort of resolved in Mighty Morphin. So when I heard that I was like, "That's absolutely the person that should be coming back in time to deal with our, to deal with the Go Go Rangers. Because it was such a great opportunity to have a bunch of teenagers see a version of their future self, and have that sort of...and how all of them would have a very different reaction to that, and how it would affect all of their relationships and all the stories that were going on at the time with the team. And it just seemed like a perfect fit." You can check out her slick costume design in the image below. Oh, and yes, that is the Bow of Darkness she's wielding. Higgins already had an idea of Kimberly's whereabouts in the world, and she just fit perfectly into the story they wanted to tell. "Well when he did the coinless world, he did, I had some ideas for where Kimberly was," Higgins said. "And it just so happened that when we developed this idea of, for Shattered Grid, and how Go Go would fit in, and Ryan can speak more to that, obviously. As he said, throwing out the idea of Kimberly and kind of some kernels I had was what, it just fit really well thematically." Kimberly seems rather determined to bring Lord Drakkon back to their universe, but Parrott is keeping things vague when it comes to her motives. "Yeah, no, all I'll say about Kimberly's relationship is it's complicated," Parrott said. Where she's at, and you'll see why. Truly what I can say, it's a fun story so that, it's been fun with Kyle, 'cause I literally, every morning I remember I'll text him in the morning and be like, "Hey this is what I'm doing with Kimberly, does this line up with what you've done?" And we go back and forth on that. So, that really, her whole creation has been sort of a combination of he and I working together. And that's really helped, I think, craft her in a very specific way. I'm being coy, but if I tell you everything, then you won't read the book." You can read our full review of Mighty Morphin Power Rangers #25 here, which is in comic stores now. Go Go Power Rangers #8 is also on store shelves.